BaseHit Real Ball Pitching Machine & 30' Xtender Home Batting Cage. Get a hit every time you come to the plate with your personal real baseball pitching machine. Trend Sports introduces BaseHit, the most affordable real baseball and lite-ball pitching machine. Complete with a rugged tubular steel tripod and a 12-ball auto-ball feeder, the BaseHit plugs into any standard wall outlet . Combined with the 30'x12'x12'Xtender Home Batting Cage, BaseHit and the Xtender become the most affordable real baseball batting system ever developed! 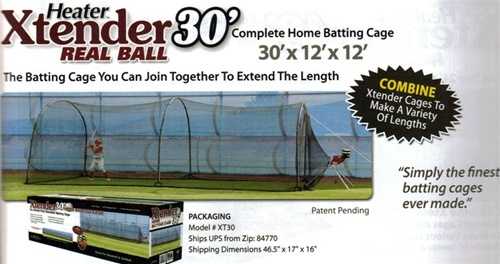 The 30' Xtender Batting Cage makes it possible to hit live pitches at home. BaseHit and the Xtender connect together with the built-in connection harness that fits over the barrel of the machine. This allows the operator and the machine to be outside of the batting cage during practice, ensuring added safety as well as eliminating the need for an L-screen. The revolutionary connection harness allows you to hit real baseballs at home without fear of damage to anyone or anything. Average Customer Review: 2 of 5 Total Reviews: 2 Write a review. The net is pretty nice but the cage frame is almost worthless. It could barely hold up the net, and the first thunderstorm of the summer flattened it. I've spent a lot of time on repairs, Very disappointing. The BaseHit pitching machine is a nice one for the money, but I will need to replace the tire soon. (Unless the cage keeps breaking) The first pitch is always low since the ball is fed before the wheel speeds up. It is a very accurate and consistent machine, overall, it does the job.